As a huge fan of Snyder’s Justice League and a big fan of Aquaman, I’ve been looking forward to this story for a while. One thing I didn’t realize going into this issue is that it’s written by Tynion instead of Snyder. Considering Tynion is a protege of Snyder, and that I like his writing as well, I had no problem with this. However, I did expect the difference in writing to interrupt the flow of this story. Luckily, this issue is a great follow up to the prelude in Justice League and Tynion is great in this issue. 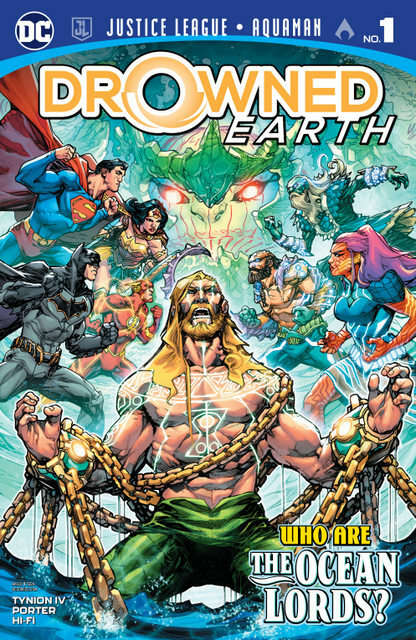 I rate all of my Justice League/Aquaman crossovers on a scale with Geoff Johns’ Throne of Atlantis at the top. While I don’t think this crossover will be as incredible as Johns’, it actually comes pretty close. I went in excited about this issue and I came out even more excited. The number one thing this issue gets right is scale. The entire issue does an excellent job at showing just how much of a threat this aquatic invasion is. The scenes of Aquaman viewing the entire invasion show just how big this story is. On the other hand, smaller scenes in Gotham and the Hall of Justice show how this event impacts the Earth on a smaller scale. We get plenty of cameos from other Justice League members. Miss Martian, Mr. Miracle, Simon Baz, and the Teen Titans are all present in this issue. That doesn’t even account for the numerous mentions of other characters. Snyder and Tynion really make the league feel connected to the rest of the DC Universe. As an Aquaman fan, this issue gives me everything I want. One strength of Justice League so far is how it keeps up with the continuity of other books. We get to see Mera lead a risen Atlantis against an army of space-fish in this issue. Not only that, but we get plenty of other Aquaman characters including Ocean Master and Black Manta. It feels like every Aquaman crossover is another revelation about the history of Atlantis. Although I love the concepts Snyder and Tynion introduce in this issue, it feels like more of the same. Even though this story doesn’t contradict anything about Atlantis’ history, I feel like it should connect to the rest of the lore established in Johns’ run. Let’s talk a second about Howard Porter on art. Porter keeps evolving his style and it somehow gets better and better each time. I feel like many artists lose their edge over time, but Porter is on top of his game. His depictions of the Sea Gods, the spaceship armada, and the Kraken in this issue are spectacular. It’s hard for an artist to stand toe-to-toe with Francis Manapul on a book, but Porter knocks it out of the park. Overall, this issue was everything I wanted and more. Snyder and Tynion do a great job at setting the stakes for the rest of this story. If you a fan of Justice League or a fan of Aquaman, I would definitely pick this up. Tynion packs a slew of big moments in this first issue, which is a good sign that it’s going to have a bunch throughout. DC has made a big improvement on how creative teams handle big and medium sized-events. Drowned Earth is another great example of the smaller scale event strategy paying off and this looks to be a memorable story that plays out in 2019.